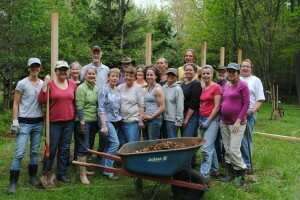 The Catskill Edible Garden Project broke ground in the spring of 2012 at the Sullivan County Cornell Cooperative Extension campus in Liberty, NY. With the assistance of Project partners and community volunteers – including CCE’s Master Gardener program participants – we constructed an educational garden facility that includes multiple composting sites, and is being utilized as a support for CCE programmatic and educational efforts. 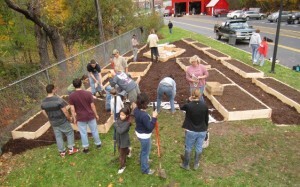 A garden was installed at Liberty Elementary School in Liberty, NY in the fall of 2012. With hands-on support from students (elementary, middle, and high school level), parents, faculty, and Liberty community members, a substantial garden was constructed on the Liberty Elementary School campus. The garden is utilized as a supplemental educational outlet for the classes at LES, and produces vegetables, fruits, and herbs for consumption by students in the school. 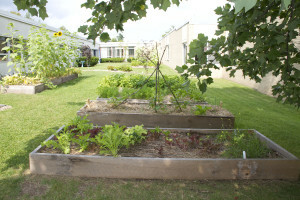 The Edible Garden at Roscoe Central School, begun in Spring 2012, marked the Project’s second garden build, and the first build on a school campus. The RCS garden build engaged every student in the school – Pre-K – 12th grade and was a true, school-wide effort. While faculty and older students were engaged in building boxes, filling beds with soil, and more of the heavy-lifting jobs involved in the build, younger students painted signs, started seeds, and had conversations about what vegetables, fruits, and herbs they wanted to plant. With back-to-back successful growing seasons, RCS has donated vegetables to the local food pantry and served their produce in the school cafeteria. 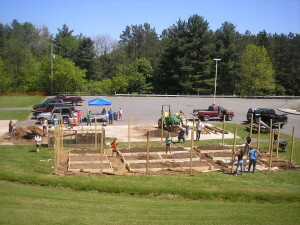 Sullivan West Central School was the third garden installed for the initial season of the CEGP. Students, staff, and other Sullivan West community members joined Project staff in summer of 2012 for a fun day of garden building. Afterwards, students and teachers met with CMK staff for planting days, and set up the garden for a very productive first season. Much of the produce was donated to a local food pantry and SWCS has developed an after-school garden club to increase students’ awareness of food production and the importance of maintaining strong, local food systems. The Catskill Edible Garden Project kicked off the 5th edible garden build at the RJK Middle School in Monticello in the spring of 2013. The garden build brought together a dedicated group of community members and students, both young and old, on a beautiful (albeit rainy) Saturday in May. Students helped to clear the area and mulched and papered the pathways while others helped to cut and assemble the garden beds. 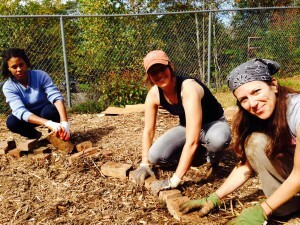 The RJK Eco Club plays an integral role in the maintenance of the garden during the school year. RJK’s garden – dubbed ‘The Garden of Eatin’ – has had multiple successful growing seasons, with increases in production going towards the preparation of school meals. RJK recently developed an after school Food Club to work in conjunction with the Eco Club to utilize the garden to its fullest potential. 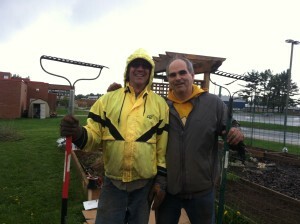 The George L. Cooke school marked the 6th garden build for the CEGP. Parents, community members, faculty and staff, along with CEGP project staff, came together on a chilly morning in spring 2013 to construct an edible garden in the courtyard of the George L. Cooke Elementary School. While folks wheeled soil back and forth through the hallway to the courtyard, students were getting creative in the classroom designing cement stepping stones for their new edible garden. The first two growing seasons at the George L. Cooke School were a great success, and much of the food was donated to the local food pantry. Currently the school is working on integrating a compost program to tie science and math to the edible garden.